Our forests provide an amazing opportunity for connecting people with the natural world. 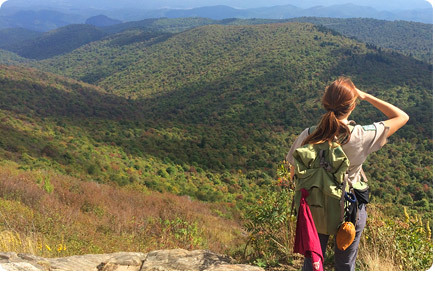 In many cases, this connection happens via organized group activities – guided hikes, climbing trips, camping excursions, and so on. Many of these activities require what is known as a special use permit from the USDA Forest Service, which authorizes the group or organization to conduct their activity on Forest Service lands. In an effort to increase accessibility for groups and organizations seeking to host activities on Forest Service lands, Transforming Youth Outdoors (TYO) and the Coalition for Outdoor Access, along with support from the USDA Forest Service, have compiled answers to some of the most frequent questions about the process, which you’ll find listed below. Before you dig in, however, we suggest you first review the guide Introduction to USDA Forest Service Recreation Special Uses, which you can view and download here. This document offers a detailed overview of special use permitting, covering exactly what constitutes special use activities, the process for obtaining a special use permit, and additional tips to help the process go smoothly. Who should I contact about special use permits—and what if my contact is not available? Your main point of contact is the Special Use Administrator of the forest you wish to visit. This person will be there for you throughout the process, from sitting down for a pre-proposal meeting to tracking the actual administration and compliance of your permit over time. If you are unable to reach the Special Use Administrator, it’s best to contact the forest’s Public Service Staff Officer, who usually operates out of the Supervisor’s Office or a local Ranger Station. If you’re having trouble reaching anyone over the phone or via email, the best thing to do is visit the Supervisor’s Office or local Ranger Station—in-person meetings are a great way to build relationships for the long term. How can I improve my chances of having my permit application approved? Assign a primary contact. This person should be in charge all special use permit operations for your group or organization. Ensure that this person is at least 21 years old, and that they are a permanent staff member or full-time employee, rather than a student, intern, or part-time guide. Schedule a pre-proposal meeting. While this is not a required step in the special use permit process, setting up a meeting before you begin filling out any paperwork will allow you to begin building a relationship with the Special Use Administrator, receive initial feedback on your proposed activities, and ask any questions you may have about the process. This is a great way to find out if there are other permit holders operating in the area you’d like to travel, discover any concerns about resources or overuse in the area, and potentially discuss alternate plans ahead of paperwork. Be detail-oriented! When you do begin paperwork, make sure that it is as complete as possible. Provide a detailed program or event description, complete with detailed maps and routes. Make sure your group or organization’s full name is used across all paperwork. Consider how you’ll incorporate the principles of Leave No Trace into your event or program, and list out specific steps for how you’ll mitigate any potential environmental impacts. Finally, list any certifications held by the program or its staff—Wilderness First Responder, AMGA Single-Pitch Instructor, etc. Submit early! Many national forests already have the next year’s work outlined by October 1st, when the fiscal year begins. Therefore, while it’s not a general requirement, it’s best to submit your proposals as early as possible—ideally in summer or early fall at the latest. Some forests do specify “open seasons,” or time windows for proposals—be sure to ask your local district if this is the case. Avoid high use areas. Your chances of having your permit application approved increase if you avoid popular areas of the forest where existing use is high. Carefully consider whether the goals of your program require you to climb the highest peak or hike on the most heavily-used trail. If not, plan to go somewhere else. This will allow the permit administrator to disperse use to minimize impacts. How can we get more service days on our permit? Why do we have less service days than other local permit holders? Before digging into the nitty gritty here, it’s important to understand that the Forest Service wants to help facilitate access to national forest lands. It does, however, have to consider the ongoing impacts of use, increased use, resources and staffing, and existing or revised forest management plans when considering capacity for each type of activity on the forest. If use is correlating with a negative impact on wildlife, for instance, the forest may reduce the number of service days it allocates. Capacity is determined forest-by-forest. Some have done environmental assessments to determine an exact number of user days for units or the entire forest; others do not have hard quotas, but determine service days on a case-by-case basis. Before applying for a proposal, it’s not a bad idea to check in with your local forest (such as during a pre-proposal meeting) or other guides and outfitters to see how existing permits are allocated. Priority use permits—those that are ongoing, semi-permanent permits—will typically receive more user days than temporary permits. If you anticipate running ongoing programs on forest land, it’s worth considering applying for a priority use permit in lieu of a temporary one, which must be re-applied for each year. Sometimes it is possible to review existing permit holders’ actual use to determine if some of those days may be allocated elsewhere to a “user day pool” for others to draw upon; while you can inquire about this with the Special Use Administrator, it’s important to understand that not every office has the staffing capacity to conduct these reviews. Is there a way to obtain a multi-jurisdictional permit between federal or state lands? Some activities—races, ski tours, etc.—may exist on lands managed by different entities, whether state or federal. As of right now, there is no universal system for coordinating permits between different jurisdictions or land managers, although this is something the Forest Service hopes to address in the future. There are several instances, however, of forests working to coordinate and issue permits across different forest units. For example, USDA Forest Service Region 2 (the Rocky Mountain Region) has experimented with streamlining the process within some of the forests in Colorado and Wyoming, so that your permit covers several forests that surround the one specified in your permit, which can be useful for events like bike races and trail runs. It’s best to ask your local office if they offer something similar. Is it possible for out-of-state groups to obtain a one-time use permit? Out-of-state groups should apply for temporary permits, which cover anything from a single day up to 180 days, for one-time events or programs on forest service land. Are there any other options for commercial groups that are unable to indemnify and/or add the U.S. Government as an additionally insured for their permit? Insurance is required for both commercial and non-profit entities who wish to obtain a special use permit; the level of insurance depends on the proposed activity. You will be asked to add the U.S. Government as an additionally insured on your policy; each policy is different, so you’ll have to ask your insurance provider what this entails for your specific policy. Some state institutions are not allowed to indemnify the U.S. Government. The Forest Service is aware of this issue and is actively working towards a programmatic solution. How do I maintain my special use permit once I have it? Pay your fees. You will be charged an annual Land Use Fee for your permit; make sure you pay this in full and on time! Update your operating plan. Every year, you will need to submit a revised operating plan that details your operations and describes how you’ll ensure environmental and human safety. Be sure to submit this on time! Don’t commit any permit violations. These are outlined in Question #9 below. Stay in communication. Remember—your Special Use Administrator is the main point of contact for the duration of your permit; if you have questions about anything, ask them! What conditions might threaten or amend an existing priority use permit? While priority use permits do cover long-term activities on forest lands, it is sometimes necessary to amend or even revoke these permits. The Forest Service is continually assessing land use from all angles to determine the best way to manage the land. They may look at use levels and potential crowding issues, staffing capacities to properly administer permits, effects on the land from natural disasters, changes in wildlife status (i.e. Endangered or Threatened Species), trends in land use, and so forth. As a result, sometimes forest management plans change, and this can affect permit terms. In addition, as described above, the Forest Service may periodically review your use to determine if there is an overage of service days that can be allocated elsewhere. What constitutes a violation of my permit, and what are the consequences for violation? Deviation from your operating plan. Your operating plan is part of your permit. Unless there are emergency circumstances, you should conduct your activities in accordance with your operating plan. Failure to do so violates the terms of your permit. Failing to report your use. Permit holders are required to report their use after their trips are over. Failure to do so violates the terms of your permit. Operating under someone else’s permit without agency approval. Special use permits are not transferrable. There is potential to operate as a ‘sub-contractor’ under someone else’s permit but it requires agency approval. Rogue guiding. Operating on Forest Service lands without a permit is a serious offense that lead to legal action that results in steep fines, mandatory community service, probation, and even jail time. Breaking federal, state, county, or municipal laws. Your permit assumes that you will comply with all laws and regulations. Operating under the same permit after a change of ownership. Your permit is no longer valid if your business or program changes ownership; the new owner will have to apply for a new special use permit. Non-payment of fees. You can be charged interest and other penalties for late payment, or your permit may be revoked. Leading programs or trips on an expired permit. The best way to prevent this is to apply for a new permit a year before yours expires. If the Forest Service has received permit renewal materials you may still be able to operate on your expired permit while the agency processes your materials. This is not true for temporary use permits. 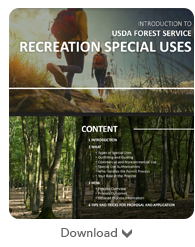 If you have already reviewed the Introduction to USDA Forest Service Recreation Special Uses and read the items above and feel that your question still hasn’t been answered reach out to your Special Use Administrator or local Forest Service field office. Questions that are specific to a forest or unit are best answered locally.